Russ Newkirk is the founder and Lead Pastor of The Roots Community Church. 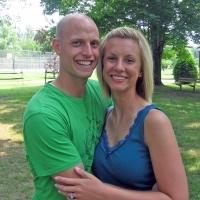 In November of 2011, God called Russ and his wife Brianna from their current roles in a local church, to step out in faith to begin the journey of launching what would soon be known as The Roots Community Church. God has continued to confirm His call by using The Roots to impact many lives in the community and beyond. The Newkirk's consider themselves blessed to be able to follow Jesus alongside the people that they love. Russ and Brianna have been married since July 17, 2004 and have since been blessed with two handsome sons, Caleb and Elijah. Outside of church there are several places that you might catch Russ and Brianna. Brianna spends her work hours as a Senior Loan Advisor and Corporate Manager at MLS Funding and her non-work hours gracefully managing Team Newkirk. She has a great love for her family, food and cooking. When Russ isn’t at the church you will most likely find him at home, a coffee shop or at a local gym pretending he can still keep up with the young guys. 1 John 3:16 – 16 This is how we know what love is: Jesus Christ laid down his life for us. And we ought to lay down our lives for our brothers and sisters.